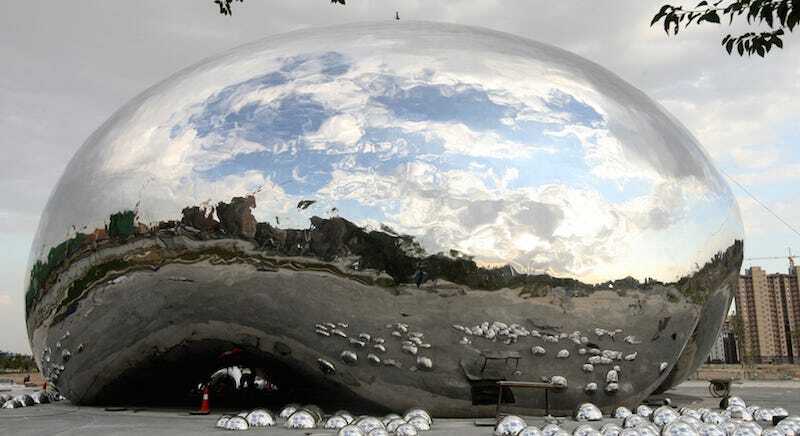 In the western China city of Karamay, you’ll find a sculpture which bears a striking resemblance to Kapoor’s tourist-magnet in Chicago’s Millennium Park. The Chinese piece is apparently inspired by the oil that’s extracted here, because oil bubbles are known for being metallic, hyper-reflective, and as tall as a three-story building. According to Blair Kamin, architecture critic at the Chicago Tribune, Kapoor is calling this plagiarism and is threatening to sue, but I’d say there are some critical differences here. Instead of a majestic Chicago skyline reflected in the Bean, there’s only asphalt and some scraggly trees. Unlike Cloud Gate, this has a blue LED light installation. And this one doesn’t look like it’s safe to walk underneath (and I’m not sure I’d be brave enough to do it). Plus, this is not only one big, Bean-like bubble, it’s actually a bunch of little bubbles, too. Not even close!